The historic summit between the president of the United States and the leader of the North Korean dictatorship is in danger. 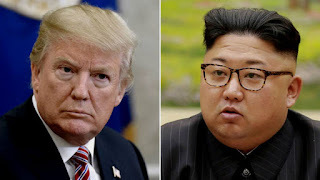 Donald Trump admitted on Tuesday that there is a "substantial" possibility that the meeting scheduled for June 12 in Singapore to agree on the denuclearization of Pyongyang could be postponed or canceled. With no press conference scheduled, the United States President responded with length to questions from journalists about North Korea to confirm a growing sensation in recent days, that the likelihood of the historic Singapore summit might not be celebrated. "Maybe [the summit] does not happen on June 12," the New Yorker said, trying to take iron out of him by saying it could be held later. "If it happens it will be great, if not, it will be fine," Trump said, but his face hardened to indicate the reasons why he believes the climate of approaching Pyongyang has changed: the second meeting that Kim Jong-un held in Beijing with the Chinese president, Xi Jinping, between May 7 and 8. "I must say I was a little disappointed," Trump said, because after that second date "there was a certain change in attitude," he added. Tensions have arisen as Pyongyang canceled the talks scheduled for those days with South Korea as a complaint for the military exercises carried out with the United States. In addition, warnings that the summit would be canceled if Washington insisted on demanding the total and unilateral denuclearization of the regime, without counterparts. The reason given by North Korea for the warning was a statement by National Security Adviser John Bolton, where he bet on the "Libyan model" of denuclearization that for Kim Jon-un turns out to be a bad prophecy, given the fall of Muammar Gaddafi in 2011. Trump has insisted that his goal is not to eliminate the North Korean regime, but he stressed that "denuclearization must take place. And this, he said, would be "better at one time", although it opened the door to a "gradual" process. He said he believes Kim "is serious" when he offers denuclearization but maintains: "There are certain conditions that we want to produce, I think we will achieve those conditions, and if not, we will not have the meeting." Washington hopes that Pyongyang completely discards its nuclear program and demonstrates that it cannot back down, but the North Korean regime finds in the atomic bomb the deterrent shield to ensure the survival of the hereditary regime that governs this small and hermetic country with an iron hand for 70 years. Trump has refused to confirm whether he had spoken with Kim. From the Oval Office, he sent a message: if he agrees to the denuclearization "he will be happy, and his country will be rich".